Beyond the limits of national jurisdiction, the water column and the air space above the oceans are governed by the regime of the high seas. When coastal states have established exclusive economic zones - and that is already (or will in future be) the rule - the high seas are the ocean space beyond the 200 nautical mile limit of this zone. The high seas are to be open and freely available for use by all states, regardless of their location Their use is to be governed by the principle of equal rights for all. 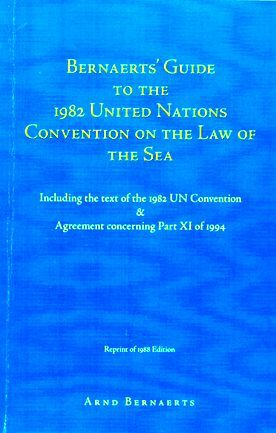 No state may validly purport to subject any part of the high seas to its sovereignty; in agreeing to the Convention, all states acknowledge that these oceans are reserved for peaceful purposes. These are, after all, merely the logical consequences of the Convention's aim to maintain peace, justice, and progress for all people of the world. Within this context, the regime of the high seas is based on the freedom to use the oceans. 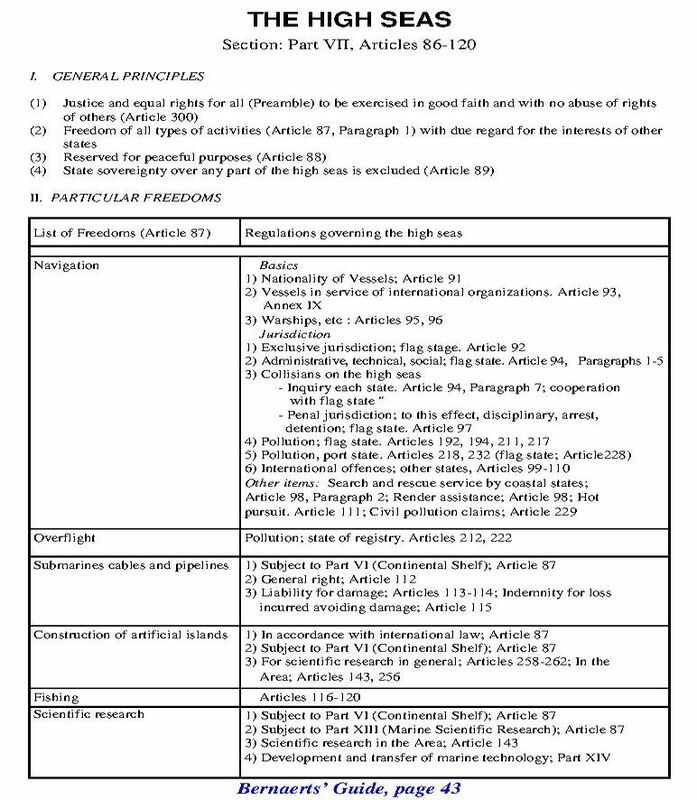 In exercising its right of use of the high seas, no state may interfere with the justified and equal interests of other states or act in a manner which would constitute an abuse of the rights recognized by the Convention. States are also to respect the activities on the sea-bed in the Area, which are managed by the Sea-Bed Authority in the interests of mankind as a whole. A similar attitude shall be required from coastal states undertaking activities on the "outer shelf," and the coastal state is to avoid any unjustified interference with the rights of other states. The Convention establishes freedom of activity in six general fields: (1) navigation, (2) overflight, (3) laying of cables and pipelines, (4) artificial islands and installations, (5) fishing, and (6) marine scientific research. This is not intended as a conclusive list, nor does this listing in any way prejudice possible rights of coastal states. Freedom of navigation is of utmost importance for all, for the shipping community and naval forces as well as for the fishing industries and marine scientific research. Every state has the right to sail ships and participate in navigation by granting its nationality to vessels which are registered with the state and which fly its flag. Such flag states have the right and duty to exercise their exclusive jurisdiction on ships on the high seas. This includes administrative, technical, social, and pollution matters. Other states are generally excluded from exercising any jurisdiction, e.g., penal, disciplinary, arrest, or detention matters in collision cases, although there are exceptions; furthermore, there are activities generally considered reprehensible (see following pages). Government-owned non-commercial vessels and warships are under no cir­cumstances subject to the jurisdiction of other states. For the use of artificial installations in and airplanes over the high seas, the Convention provides only regulatory provisions in respect to scientific research and pollution. For these freedoms and those of fishing, cables, and pipelines, see Further Readings .